Mobile World Congress is fast approaching, and Nokia may be primed to launch a pair of new Lumia smartphones, judging from regulatory certifications discovered overseas. CNET reported Friday that filings with the Directorate Post & Telecommunication office in Indonesia reveal the existence of two new Nokia Lumia smartphones. The unannounced Lumia 720 (RM-885) and Lumia 520 (RM-914) handsets already passed certification on Wednesday, through the Indonesian equivalent of the Federal Communications Commission (FCC) in the United States. 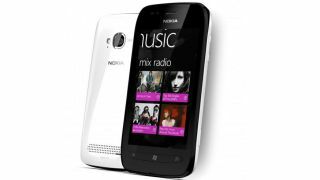 Without confirmation from Nokia, the devices are currently assumed to be follow-ups to the mid-range Lumia 710 and low-end Lumia 510, respectively. With MWC kicking off in Barcelona, Spain in just over two weeks, it's not hard to imagine that Nokia might officially unveil new Lumia devices at the event. According to an unnamed source, the Lumia 520 could come packing a four-inch Super Sensitive touchscreen, 1GHz dual-core processor, 8GB storage, micro-SD card slot and 5MP rear camera, but the budget-minded device leaves out a front-facing camera. A little further up the scale, the Lumia 720 is rumored to feature a 4.3-inch ClearBlack display with other specs similar to the Lumia 520, upgrading the rear camera to 6MP and adding a 2MP front-facing camera. Both handsets are expected to run the latest Windows Phone 8 software, although it's probably too early to consider leaked specs the final word on that subject.